See scan - very good condition. This is a very rare British / Great Britain Royal Semi Porcelaine Staffordshire decoration plate nicely manufactured and numbered with a real propaganda picture / image caricature showing the Serbian / Serb King Alexander crying in front of the Austrian Emperor. The Austrian Emperor says - DON'T CRY MY DEAR ALEXANDER - LEAVE HIM IN PEACE. He says that taking in mind the aggressive Bulgarian Prince / King Batenberg who started the Bulgarian - Serbia War in 1885 (which lasted a year). The Bulgarian Prince Batenberg blames the Serbian Alexander at the plate by saying - HE STARTED FIRST... The Austrian Emperor hands a truce proposal to both of them just like they are kids... The plate is numbered 41893, as well as it is marked and numbered at the back too. 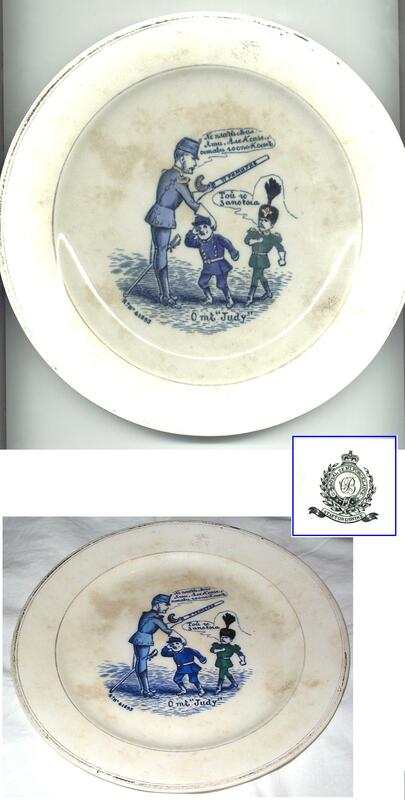 Absolutely scarce political satirical / satire propaganda collector porcelain and one of the nice such porcelain plates I've seen.